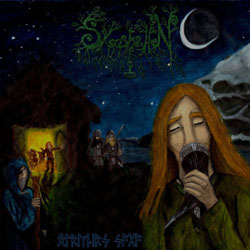 American Viking folk black metal band Skogshallen from California has recently released its debut full-length album. The band was formed in 2005 (with a different name) as the solo project of Vidfrey and remains a one-man-band with several guest musicians since then. In 2011 Skogshallen released the demo album “Northern Lights” and 3 years later, on May 1st 2014, the time for the debut album has come. “Ölrunir’s Saga” is a self-released album, while its physical copies are distributed by Kunaki. Skogshallen is a very pleasant band to listen to, especially if you are not looking for something too “serious” and you just want to “fix” your mood. Of course these is still a lot to improve, but if you are a fan of Viking folk metal you better give them a listen. “Ölrunir’s Saga” is self-released and is available in their Bandcamp page. It is also distributed in jewel-case edition CD with a 2-page cover, printed by Kunaki. You can visit the band’s official pages for more info and music, following the links below.